We’ve all seen the photos and paintings of migraineurs’ suffering faces during an attack. 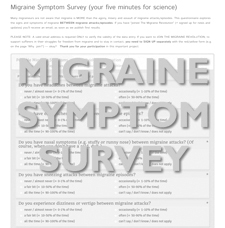 What many haven’t seen yet, is what actually happens during a migraine episode. 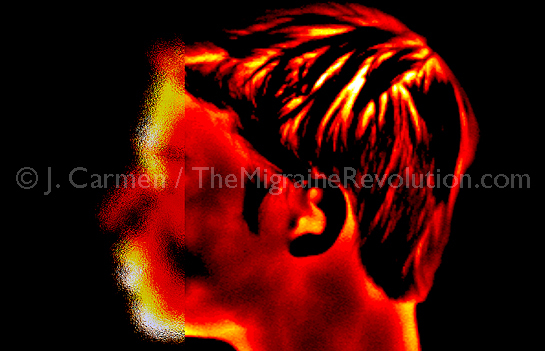 Here is an infrared image of a young man during status migrainosus; a migraine attack without an end. His skull appears to be glowing under his short hair. Since this an infrared image—showing heat, not visible light—the expression “glowing” pretty much hits the mark: His brain is radiating excessive heat. In the entire body, including the brain, excessive heat is produced by cells that work unusually hard. During a physical workout, we need to push it a little, to work up a decent sweat; average activity levels don’t produce excessive heat. In that regard, the brain is exactly the same; excessive heat is produced by brain cells that work unusually hard. However, in contrast to muscle cells, brain cells are supposed to work smart, not hard. Their task is to communicate with one another efficiently and—judged by the excessive heat radiation in this example—the brain cells (neurons) seem to be running in circles screaming. A bit like kindergarten kids when their teacher is weak or absent. A successful rehabilitation, even of chronic migraine disorders, is possible, when the “teachers” in the brain learn to keep their rambunctious “kindergarten neurons” under loving control. That can be accomplished with Applied Neuroscience as part of the customized comprehensive program that we call: The personal Migraine Revolution.